Lloyd, Beth and I (and many other people!) spent the afternoon helping Annette move into her new house. Unfortunately, every picture I took is blurry, or the people in the photo have unflattering expressions, so no pics of that. But we were wicked fast, I must say! One of the reasons we were so fast is that it is FREEZING cold here! The high was 9, but we have some Artic gusts that made it feel like -15 to -20. 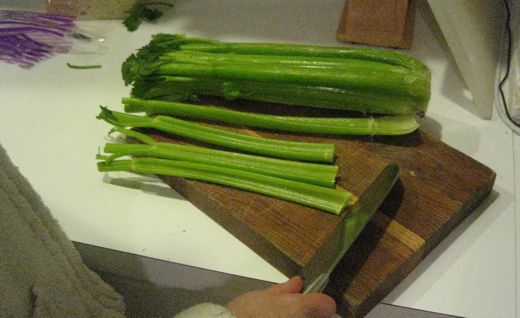 Speaking of freezing, let me tell you about my celery. At Wal-Mart today, I told Lloyd I’d like to buy some celery to freeze for those few times when I want cooked celery in a dish. (Soup, stuffing, etc.) We had a discussion about flash-freezing, where I sounded like I knew everything and he told me I was full of frozen beans. Whatever. We brought the celery home. After helping Annette move, I wanted to chop up that celery and set the pieces on a pan outside to see how fast they could freeze. “Where’s the celery?” I asked Lloyd. “Outside like you wanted,” he answered. *sigh* He doesn’t cook much, so I can’t blame him. But really? Do you know how hard it is to chop up celery that has frozen into a block of ice? Good thing he’s pretty. Once it was frozen, you should have used a reciprocating saw. That would have done the trick. If it was frozen solid, maybe you could have whacked it with a hammer & it would have broken into a bachillion perfectly sized pieces just right for stews & such. Then you could give the hammer a fancy name & gone on TV and sell it…but wait, there’s more…. Too funny! I think sometimes you have to leave out the details of why and just ask for a single favor. It was 69 degrees here around 5:00 this evening. No freezing vegetables in Baltimore today! *sigh* It’s 8:14 and it’s -1, but at least it feels like -11!